A gun that people have endlessly asked me to review is the Smith and Wesson Military and Police pistol that S&W burst into the gun scene a few years ago. Smith and Wesson has had its ups and downs over the years, but the company is one that's getting it right now. 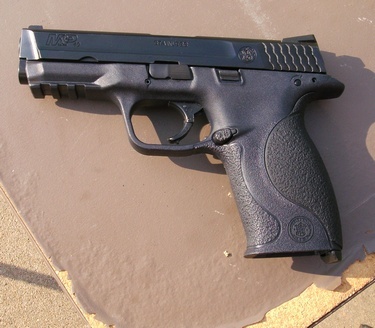 The M&P .40 S&W is one of those right things as is the whole line of guns growing more popular by the day. Predictably Smith and Wesson has developed a whole assortment of sizes and calibers of the gun that rivals any polymer pistol on the market. One of the first things they got right about the gun was the stuff included with it. The gun we tested came with three high capacity magazines, several removable back straps to adjust grip width, night sights, and a carrying case. Putting in one more than the standard two mags is a nice touch and the back strap system is one that GLOCK would do well to get on board with. It makes it a natural choice for people who like a polymer framed pistol but balk at them because of the inability to adjust the grips. One size fits all just doesn't cut it any more. 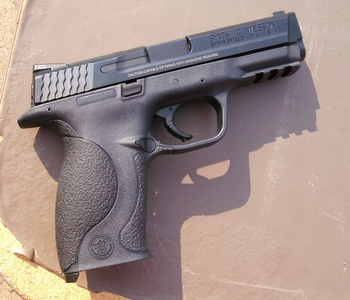 The Smith and Wesson Military and Police sports an ambidextrous slide release. The magazine release can be changed to left hand use. The guns come with an optional magazine disconnect for law enforcement or military. As with many handguns today it has an internal lock system that can be used or not. So how did the S&W M&P perform? Well, I had a considerable advantage in evaluating this gun because it belongs to a friend who just had it issued as a duty weapon for his job with a federal security company. And to give it even more credibility, two more friends of mine who are his co-workers for the same company also had them issued as duty weapons. As chance would have it, all three of them had just finished qualifying for their firearms requirements in the company. So, this particular gun had had 760 rounds put through it when it reached the range. The other two guys' guns had similar amounts. All had performed flawlessly and all of them had successfully qualified for the difficult course they had to run. During our range test, we put approximately another 250 rounds through it fast, slow and everything in between and it kept on going strong. Perfect performance. Everybody who picked up the gun loved it. 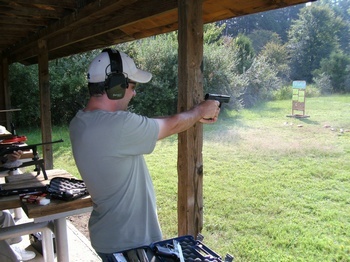 It pointed naturally, fit the hand nicely and was as accurate off hand as any tactical handgun on the market. Something I appreciate that S&W didn't do was follow in the line of Springfield stupidly rating their trigger pull through a 2 lb range. S&W rates the trigger pull at 6.5 lbs so you don't have to guess what you're getting. Below is the owner of the gun, Eric, taking pot shots at reactive targets. I shot the Smith and Wesson Military and Police also, and as much as it pained me to admit it, I liked it about as well as any of my GLOCKS. What companies like Smith and Wesson and others have done is taken a successful platform (GLOCK) and added some touches to the guns to make them more user friendly. And that's the future of polymer framed pistols because there's only so much that can be done with them that is considered "innovative". One thing that I would change about the Smith and Wesson Military and Police is the unnecessary beaver tail that extends out past the back of the slide. The same shape could be retained for a good grip without the sharp point of the grip sticking out. I hate it on 1911s and I don't like it on these for sure. And while there can be some argument for them on 1911s, there is not a good one for these guns. The gun we tested could easily be carried concealed in an inside the waistband holster if you wanted to feel like a butter knife was being stuck in your side all day. Smith and Wesson now has a large selection of these guns and the compact models do not have the extended beaver tail. But this gun could easily do double duty as a CCW weapon if not for that. It may make them look cool, but takes away some functionality unnecessarily. Outside of that, there's not much to dislike about the Smith and Wesson Military and Police .40 S&W. Specifications of the gun are as follows: Model: M&P, Caliber: .40S&W, Capacity: 15+1 Rounds, Barrel Length: 4.25", Front Sight: Steel Ramp Dovetail Mount - Tritium Sights Optional, Rear Sight: Steel Novak® Lo-Mount Carry - Tritium Sights Optional, Trigger Pull: 6.5 lbs.,Trigger Travel: Rest to Fire .300 in. Trigger Reset: Approx. .140 in., Frame: Large, Finish: Slide and Barrel Black Melonite®, 68HRc, Overall Length: 7.5", Material: Zytel Polymer Frame, Stainless Steel Barrel/Slide and Structural Components, Weight Empty (No Mag): 24.25 oz., Overall Height: 5.5", Width: 1.2", Sight Length: 6.4". Several versions of the gun now have an external flip up thumb safety. The gun we tested sports a passive trigger safety and a striker block safety, but no external safety. 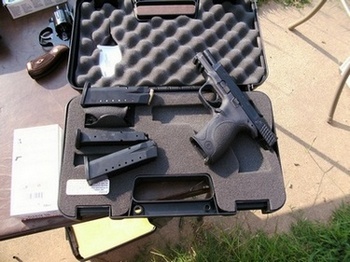 So, it's no different than carrying an out of the box GLOCK except that the trigger pull is a bit heavier. 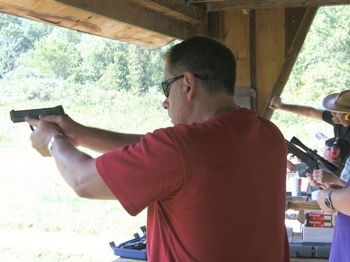 There is no external safety and keeping your finger off the trigger while handling is essential. Nothing is going to save you from a negligent discharge except for standard careful gun handling. BOTTOM LINE: The Smith and Wesson Military and Police .40 S&W is a solid, dependable gun that takes a successful platform and adds features that the average gun owner will consider genuinely useful. The gun is obviously dependable and durable enough to be considered a valid choice for Law Enforcement and Military even after just a relatively short time on the market. Smith and Wesson got it right with the M&P line of pistols. Early 2014 update: This gun reviewed and the several others mentioned are still going strong with regular use after another 3 1/2 years. The guns are still being issued by the federal security company that owns this one. The Military and Police 40 cals continue to prove S&W produced a winner that will keep on going.